The 2016 Kansas high school football season has come to a close as state champions were crowned in the six 11-man classes this past weekend. Five teams highlighted as preseason No. 1’s in the Kpreps.com rankings captured state titles this fall. The other three classes were won by teams ranked No. 3 and No. 5 in our preseason poll, while only 4A-II champion Pratt was unranked to begin the season. Let’s take a look at the final rankings for the 2016 season. 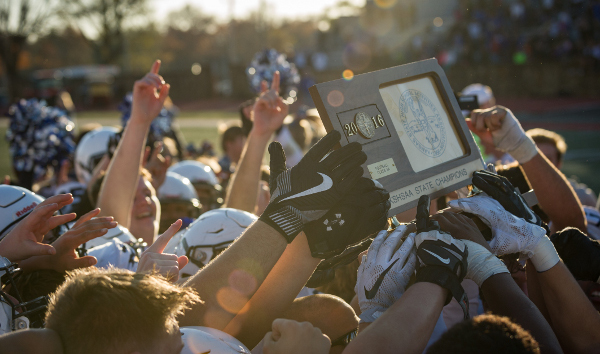 The Derby Panthers captured their third Class 6A state championship in the past four years with a 17-14 victory over Blue Valley on Saturday. Blayton Tullis kicked a 21-yard field goal with 27 seconds remaining to break the 14-14 tie. Quarterback Dan Dawdy tossed touchdown passes to Michael Littleton and Kenyon Tabor for the Panthers. Blue Valley finished No. 2 in the poll followed by Shawnee Mission East, Lawrence Free State, and Hutchinson. In Class 5A, Mill Valley made it back-to-back state championships with a dramatic 35-34, double-overtime win over Goddard. The Jaguar defense came up with an improbably stop in the first overtime when linebacker Dylan Smith jarred the ball loose of Goddard running back Kody Gonzalez before he crossed the goal line for the winning score. After a missed Goddard PAT in the second overtime, Mill Valley quarterback Brody Flaming connected with Evan Rice on a touchdown pass to tie the game and Jack Matchette added the winning PAT. Flaming threw three touchdown passes to Rice and two more to Ben Hartman for Mill Valley. The Jaguars, which began the season ranked third, finish on top of the poll just ahead of the Lions. The remainder of the Class 5A poll finishes with St. Thomas Aquinas at No. 3, Wichita Heights at No. 4, and Great Bend ranked fifth. Bishop Miege cruised to a third consecutive 4A, Division I state championship with a 53-21 win over Buhler. The Stags blocked two punts for touchdowns in the game, and Carter Putz passed for 329 yards and five touchdowns. Jafar Armstrong had eight receptions for 219 yards and three touchdowns making him the Kansas career record-holder for touchdown receptions with 45. Armstrong broke the prior record of 42 shared by Harrison Hill of Wichita Collegiate and Kendall Fisher of Garden Plain. Buhler finishes the season ranked No. 2 followed by Basehor-Linwood, Maize South, and McPherson. .
Pratt began the season unranked but finishes on top of 4A, Division II after a dominating 48-14 victory of Topeka Hayden in the state title game. The championship was the Greenbacks’ first since 1995. Sophomore Travis Theis rushed for 266 yards and four touchdowns in the win for the Greenbacks. The remainder of the poll has 2015 champ Holcomb finishing at No. 2 with both of the Longhorns losses coming by 7 points to Pratt. Topeka Hayden finishes ranked third, while Holton and Frontenac round out the top five. In Class 3A, Rossville won a third consecutive state championship with a wild 48-42 overtime victory over Hesston. The Bulldawgs trailed for much of the game before Dawson Hammes scored from 7 yards out with 1:22 left to tie the game at 42 and force overtime. In overtime, Hesston fumbled at the goal line on its possession. Rossville took only one play as quarterback Jacob Bradshaw scored on a 10-yard run to provide the winning points. Bradshaw finished with 275 yards rushing and passed for 148 more yards. After a 1-3 start to the season, Hesston went on an incredible run to finish as the 3A runners-up and ranked second in our poll. Nemaha Central, Hoisington,and Phililpsburg round out the final 3A poll. The Troy Trojans won their first-ever state football championship with a 28-24 victory over Plainville. The game-winning score came on an 82-yard touchdown pass from Reid Greaser to Brody Winder late in the third quarter. The pass was initially intended for Troy’s Cuttar Huss, but was deflected to Winder who raced for the score. Plainville finishes ranked second in the 2-1A poll followed by Smith Center, St. Mary’s Colgan, and Washington County. On November 19th in Newton, Osborne completed an undefeated season by capturing the Eight-Man, Division I title with a 38-24 victory over St. Francis. The victory gave the Bulldogs their second state football championship in the past four years. St. Francis finishes second in the poll followed by Spearville, Burlingame, and Central Plains. In Eight-Man, Division II, Hanover topped Dighton 68-22. The Wildcats captured their fourth state football championship thanks to a dominating defense that allowed only 72 points all season. Dighton finishes ranked second this season, while Pike Valley, Sharon Springs-Wallace County, and Beloit St. John’s-Tipton close out the rest of the 8M-II poll.